Beef, Mutton Briyani (Recepi Daging Briani). This special briani dish requires cooking skill, which is normaly served during special occasion eg. Ramadhan, religious feast or Weddings with nasi minyak, tomato rice or briani rice. Popular side dishes include acar timun, pacri nenas and acar buahan. Marinate the meat with yogurt. Pour Ghee and oil into heated pot. Add the rempah tumis and sliced onions till golden brown. Add in the onions-ginger-garlic paste. Stir-fry till light brown. Add in marinated meat to the pot. Sitr the meat evenly. Add tomato puree, tomatoes and green chillies. Stir lightly. Mix rempah briyani with water till a thick paste in a small bowl and add it to the pot. Add in chopped coriander and mint leaves. 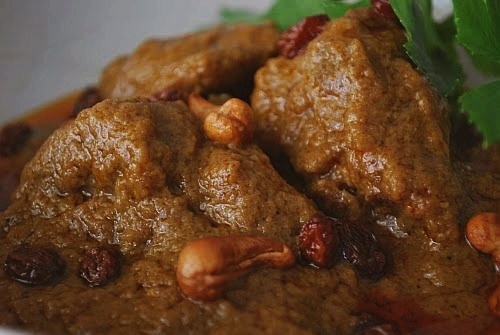 Untill the meat if tender and cooked, add fried onions, fried cashew nuts, raisins, choped corriender to garnish. Serve hot with briyani or tomato rice. Loved the site. Tons of great recipies. Easy to navigate. Loads quickly. Will definitely be visiting again..